A group of scientists from Washington University at St. Louis, USA have disclosed experimentally how CO2 is captured by polymers with quaternary nitrogen cations. Using solid-state nuclear magnetic resonance (NMR), the authors established that CO2 molecules were absorbed as bicarbonate anions (HCO3–). The increasing amount of CO2 has posed a number of concerning environmental issues such as climate change, rising sea level and ocean acidification. Capturing CO2 from the atmosphere is an effective way to lower the CO2 concentration. Recently, a family of polymer absorbents containing quaternary nitrogen functional groups, termed humidity-swing polymers, have been identified as promising absorbents to absorb CO2 directly from air. However, the limited understanding of the chemical mechanism related to their CO2-capturing capability hindered the development of these promising absorbents. In ChemComm, Yang et al. used solid-state 13C NMR to explore how CO2 molecules were captured and released. 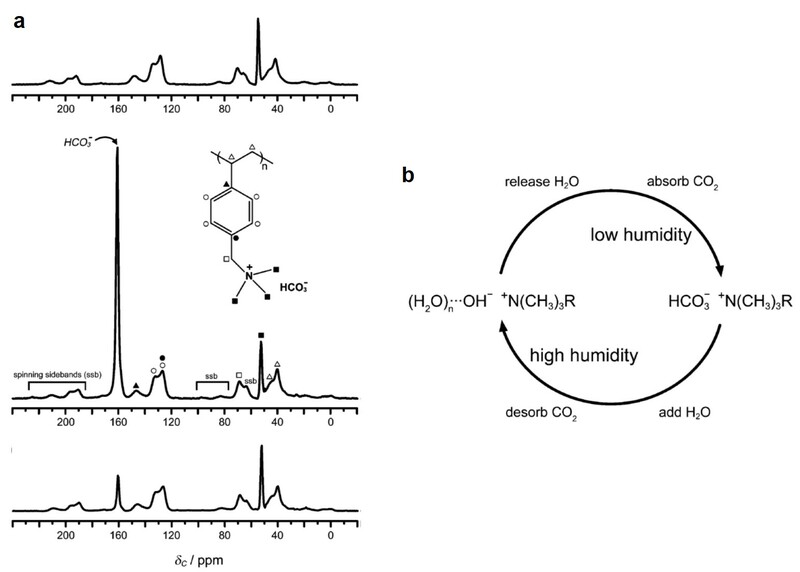 Figure 1a presents the NMR spectra of a humidity-swing polymer absorbent itself (top), upon contacting with CO2 (middle) and after releasing CO2 (bottom). The most striking feature is the appearance of an additional sharp peak at a chemical shift of 161 ppm in the middle spectrum, which did not show up in the other two spectra. The authors further studied the shape evolution of the additional peak, with respect to temperature, and concluded that the peak was due to HCO3– anions. Additionally, the authors also identified the presence of hydroxide anions in the absorbent after CO2 was released. Figure 1. (a) The solid-state 13C NMR spectra of the humidity-swing polymeric absorbent (structure shown in the inset of the middle spectrum) itself (top), upon contacting with CO2 (middle) and after releasing CO2 (bottom). (b) The proposed pathways of how CO2 molecules interact with the quaternary-N anions of the absorbent. The researchers then proposed the CO2 adsorption-desorption mechanism (illustrated in Figure 1b) based on the experimental results. The storage and release of CO2 depend on the humidity level of the surroundings: When the humidity is low, the polymer absorbs CO2 and forms HCO3– anions; the negative charge of HCO3– is counter-balanced by the neighboring quaternary N cations. When the humidity is increased, HCO3– anions combine with water and decompose to CO2 and hydroxide anions. This proposed pathway does not involve CO32- anions, which differs from the previously-reported mechanisms derived from theoretical simulations. The published results represent the first set of experimental evidence elucidating how CO2 molecules interact with humidity-swing polymeric absorbents. The acquired mechanistic insight could provide valuable guidelines for the design of CO2 absorbents with ultrahigh absorption capacity.